Having your car mirrors properly adjusted is important, so you can see everything happening on the road. Vehicles typically feature three mirrors, total: two side view mirrors and a rear view (or inside) mirror. The team at MyDriverLicenses.org recommends always checking your mirrors before you start your car’s engine. If you share a vehicle with another driver, it is crucial that you check your mirrors and make the necessary adjustments each time it is your turn to drive again. 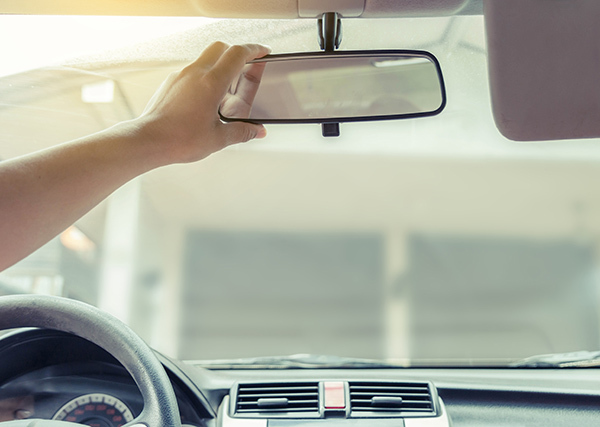 If you do not adjust the mirrors in your vehicle, you may not be able to see certain things, like cars switching lanes or someone tailing you too closely from behind. Continue on below to review some tips on how to adjust your mirrors properly so you have the best view of the road when driving your vehicle. According to the experts at MyDriverLicenses.org, your side view mirrors are necessary in order to be able to see the traffic coming up from behind you and switching lanes next to you. They are also needed so you can switch lanes safely, yourself. There are two side view mirrors in each vehicle: the right side view mirror and the left side view mirror. Different car makes and models feature different mirror adjustment mechanisms. The experts at MyDriverLicenses.org suggest beginning the process by locating the side view mirror knobs, which are generally in one of two places: on the driver’s side door near the window switches, or on the front of the vehicle dash beside the wheel. Typically, there is a switch that adjusts the mirrors to the left and to the right. You will need to choose one mirror at a time to adjust. The best way to move the driver’s side view mirror properly is to put your head against the window and work the mirror rotation until you can just begin to see the side of the car in the mirror. For the passenger side view mirror, with your head slightly above the center console, adjust the mirror until you begin to see the side of the car in the mirror. Your rear view mirror is needed in order to visualize what is happening behind you while you are driving. The rear view, or inside, mirror is located in a centered position on the inside of your vehicle’s dash board. It extends from a secured lever and is easily adjustable with the slightest movement of your hand. The team at MyDriverLicenses.org reminds drivers to be careful not to nudge this mirror accidentally after adjusting it; the faintest movement can throw your entire view off. Unlike side view mirrors, rear view mirrors are typically universal from model to model and require the same steps for adjustment. In order to make your adjustment, sit in the driver’s seat. Then, adjust the mirror until you have a view of the entire back window. Note that you should never have to move your entire head – just your eyes – while using this mirror. After you have adjusted all three mirrors, test out your view while your car is parked. If you need a view of moving cars, you can use a parallel parking spot to see the moving cars, and make sure you can visualize whatever is necessary before driving. The experts at MyDriverLicenses.org remind you that even with the most pristine mirror adjustments, cars still have blind spots. Learn your blind spots and be extra cautious when making lateral movements in your vehicle.